As committed walkers ourselves, we’ve struggled over directions that are too vague, out of date, too technical or simply too dull. When we lived in Britain our favourite walking guide was an old AA walking guide that not only gave simple directions but also included interesting and useful snippets of information about the area and helpful tips. It was a joy to use. As well as simple, but detailed directions for the main route, the guide includes suggested detours, refreshment stops, toilets, historical and cultural information, weather conditions, flora, tips about walking in that particular area, photographs and how to get there by public transport. It’s aimed at people like ourselves. People who enjoy all aspects of exploring the countryside on foot and want to discover the most spectacular spots on this magical island. Our walking guides also include the best of Tenerife's towns & cities. Now available are Santa Cruz & Puerto de la Cruz. The number one area for walking. Exploring the Anagas in the northeast of Tenerife is akin to stepping into a living museum and discovering a taste of what life in Tenerife was like before tourism. Atmospheric ancient laurisilva forests (some of the only remaining ones on the planet as the ice age destroyed most); tiny remote rural communities who scratched a living by working the back breaking narrow terraces which cling to the side of steep ravines and lush undulating hill country. Beautiful, dramatic, breathtaking, challenging and rewarding; the Anagas have all the ingredients for classic walking. The Cruz del Carmen to Chinamada circular walk (11.2km, 3.5hrs) – great views and a troglodyte community. Chamorga to Roque Bermejo (10km, 5hrs) – Tenerife’s easternmost point and a fishing village whose only access is from the sea. Place to unlace the boots: The Cruz del Carmen bar and restaurant sits in the centre of the forest; a sanctuary for walkers and local farmers alike. The explorer and scientist Alexander von Humboldt described the Orotava Valley above Tenerife’s north west coast as one of the most beautiful places in the world, so who are we to argue? 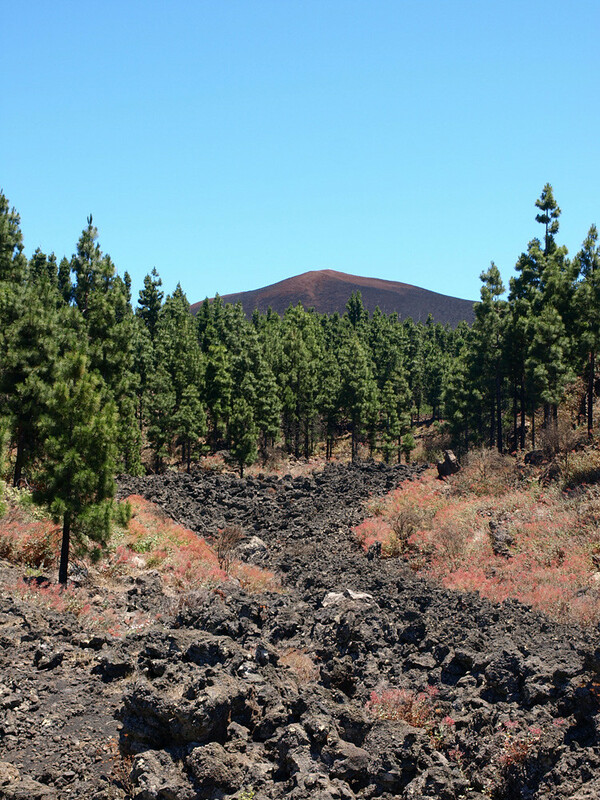 From the La Caldera zona recreativa (picnic area), dappled pine forest paths and eucalyptus glades lead to impressive vistas of the lush valley sweeping to the coast below whilst the sleeping giant of Mount Teide looms benignly above. Forest walking at its best. Best hike: The circular route from La Caldera to Los Órganos takes in the best of the Orotava Valley with amazing views and some sheer drops which add that thrill of adventure (13km, 4hrs). Place to unlace the boots: The log cabin bar at La Caldera. A perfect woodland haunt with good home cooking and cold beers at no frills prices. Don’t stop before setting off or the walk will never take place. Difficulty: Around La Caldera, an easy workout. Head upwards and the lungs will soon let you know you’re walking at altitude. 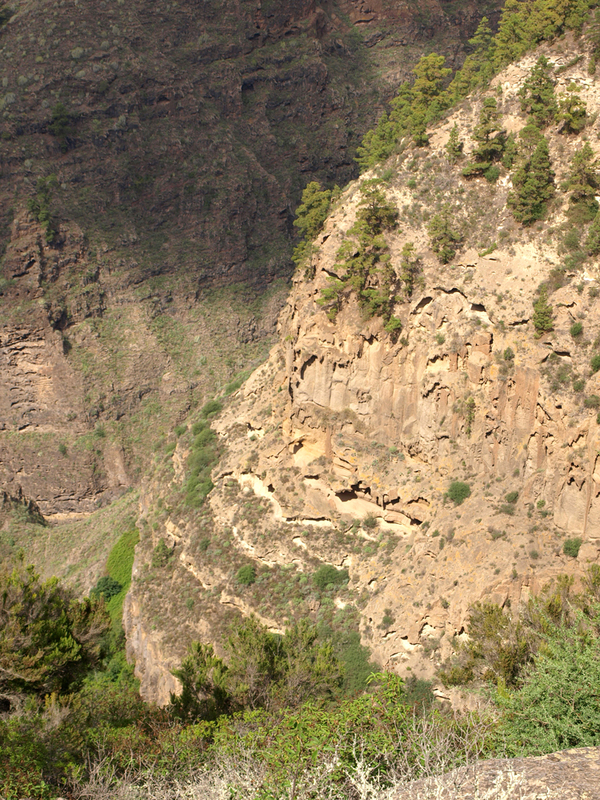 The Barranco del Infierno in Adeje is one of the most popular walks on Tenerife. This is mainly because of its proximity to the main tourist resorts in the south. It’s pleasant for sure, but experienced walkers may find it a bit too manicured. We prefer the rugged mountains above the barranco. Jablé terraces, pine forests, deserted valleys and narrow paths which cling to the sides of cliffs are in complete contrast to the modern resorts on the coast way, way below. The old and the new of Tenerife in one scene. Best hike: The old merchant’s trail from Ifonche to Adeje. Well it would be if the trail hadn’t fallen into the abyss of a ravine half way along. Still there’s enough left to give a taste of a southern Tenerife which is world’s away from the fun-in-the-sun at the coast (5 km, 2hrs). Place to unlace the boots: Tasca Taguera near Ifonche looks like it’s been built from leftovers; the outside tables underneath rickety vines are made from old wooden cable drums. Wonderfully laid back and friendly. If you time your visit with the grapes ripening the old man will lend you a pair of scissors and tell you to ‘help yourself’. 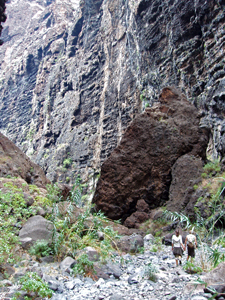 Difficulty: Around Ifonche and Barranco del Infierno, relatively easy strolling. Delve deeper and you’ll need a head for heights. Almost a mirror image of the Anagas at the other end of Tenerife, except with the western resorts of Los Gigantes, Puerto Santiago and Playa de la Arena not so far away, Teno doesn’t feel quite as remote. From lush valleys, like El Palmar and Santiago del Teide, to hill top communities at Teno Alto, where once great forests have been replaced by arid hills, a few isolated farms and herds of mountain goats, to the magical charms of Masca; this is another area which is overflowing with diversity. Best hike: It has to be the Masca Ravine. Three hours descent through an incredible prehistoric landscape where the ravine walls close in overhead and if a pterodactyl flew by you’d think ‘yep, I can believe that’. Smart people catch the boat from the bay at the mouth of the ravine. Masochists make the return trip on foot to Masca ( 17km, 6hrs). Place to unlace the boots: Any walker worth their salt will have availed themselves of the hospitality of Bar Fleytas at the Erjos pools. Perfectly positioned for many walks and great home-made almond cakes too. In Masca, if you’ve hiked the ravine both ways you’ll limp straight to the nearest bar; luckily it’s got good food, cold drinks and the occasional Canarian musicians. Difficulty: Like Anaga, this is ancient mountain country and mountains mean muscle work. Experience exploring another planet without a) being encumbered by a spacesuit and b) having to pay for a space shuttle ticket. The ‘other worldly’ description of Mount Teide’s crater may seem clichéd, but scientists really do test robots destined for Mars here. 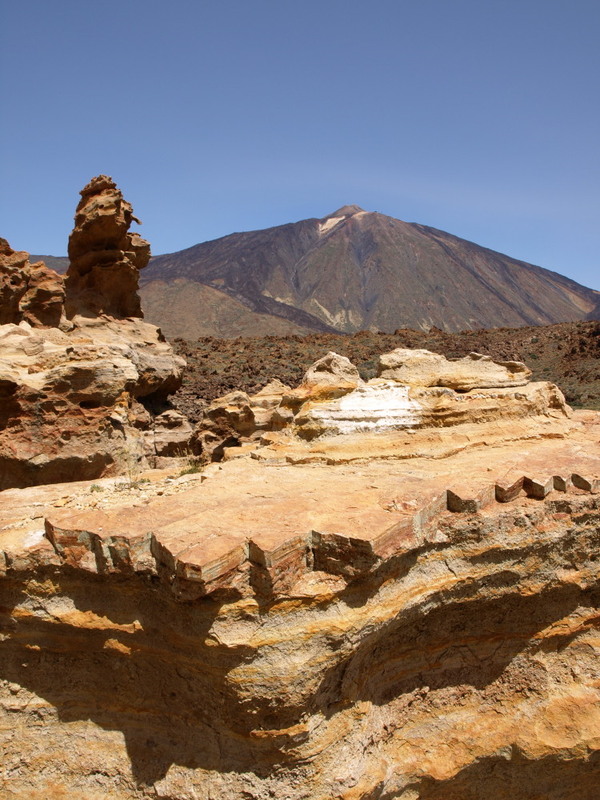 It’s the number one tourist attraction on the island which means millions of people visit it annually; however, walk a few hundred yards along any of Las Cañadas del Teide’s well marked paths and you’ll soon find that you have its surreal charms all to yourself. Best hike: The ascent of Teide is one of those ‘once in a lifetime’ experiences, especially if combined with a night at the Altavista refuge and a dawn ascent of the summit (5hr, 1500 metre ascent at altitude). Place to unlace the boots: You won’t find any that aren’t geared towards mass tourism, but we’d opt for the cable car restaurant purely because it has the distinction of being the highest in Spain and the views are awesome. Difficulty: Paths along the crater floor are suitable for most people. Climbing Teide is only for experienced walkers with a good level of fitness. Tenerife’s east coast has never quite taken off as a popular tourist destination, possibly because of the near constant breeze which tends to characterise east coasts everywhere. The Güímar Valley is almost as stunning as the Orotava Valley on the other side of the cumbre, yet it’s one of the few places left where it’s possible to walk all day without seeing another person. Silent pine forests, volcanic cones, sheer ravines and deserted mine encampments; some areas are like Las Cañadas del Teide, Masca Barranco and the Orotava Valley rolled into one. Best hike: The pilgrims’ trail from La Crucita Mirador to the Caldera de Pedro Gil. It feels like undiscovered country (14km, 5.5hrs). Place to unlace the boots: Like we said it feels undiscovered and the price for that is that there aren’t any, unless you make it all the way to the towns of Arafo or Güímar. Difficulty: There are wide forest paths, but this is still walking at altitude, so a decent level of fitness is required. A hiker’s paradise may not be the first thing that springs to mind when Tenerife is mentioned; amongst the Canary Islands, the neighbouring island of La Gomera tends to hold that distinction. Yet Tenerife possesses a richness of diversity in its landscapes and scenery which makes it ideal for visitors who enjoy getting out and about on foot. Whether it’s idly strolling along the coast to a favourite restaurant or pushing the stamina boundaries for the buzz of achievement and of sights unseen by most residents, let alone visitors, Tenerife offers hundreds of kilometres of paths and trails. If you like being master of your own timetable and pace and wish to easily access the best hiking trails independently, a car is an essential. Although the island has good coverage by bus, routes into the hills and mountains offer infrequent services and you could find the routes you’re able to take restricted by the time of the last bus back to your resort. Up until a few years ago it was rare to encounter British walkers on Tenerife’s trails, but slowly the British are discovering what the rest of Europe, especially German visitors, have known for years; that Tenerife is a fantastic holiday location for walkers and hikers. Fascinating routes course through dense forests, plunging ravines, ‘other worldly’ volcanic landscapes and unspoiled coastlines; in some places it’s possible to walk all day and never encounter another living soul. At Real Tenerife, as well as exploring Tenerife by car, we’ve spent much of the last four years hoofing it up hill and down dale and, although we’re pretty sure that we’ve still to discover a good deal more of what walking on Tenerife has to offer, we’ve compiled this guide to what we consider are some of the best places for lacing up your boots, slipping on your rucksack, splashing on some sunscreen and heading off into the great outdoors. Most of the popular walking trails on Tenerife tend to be inland; however, there are plenty of equally enjoyable coastal paths. Here are three which we particularly like. A real favourite and one which is becoming more popular every year. Paths from the San Pedro Mirador in Los Realejos, just outside Puerto de la Cruz, lead through banana plantations and past delightful old haciendas to a tropical coastline dotted with palm groves, hidden coves and a solitary fort. Absolutely exquisite. Place to unlace the boots: The restaurant at the San Pedro Mirador. Great views of the coast, perfect for a sundowner. Difficulty: Some steep parts, but overall within the reach of most people. Beautifully developed and maintained path near Tenerife’s western tip. Fantastic natural rock pools along the route make it ideal for walking and wading. The dramatic Teno mountain backdrop and turquoise waters add up to a feast for the eyes. It won’t take anyone long to figure out why the place was named ‘Buenavista’. Place to unlace the boots: El Burgado’s fishing net covered terrace overlooking the coast is a wonderful spot to have desert island dreams. Malpaís means badlands; however, this area is anything but. Fascinating trails lead through a landscape fashioned by volcanic activity and bordered by the Atlantic Ocean. There’s a surprising variety of fauna and flora as well as some interesting curios such as ramshackle fishing communities in abandoned World War II bunkers and volcanic cones and tubes, one of which was used as a dumping ground for old donkeys which had outlived their usefulness. Place to unlace the boots: La Charcada at El Puertito is an inviting seafood restaurant right next to the town harbour’s equally inviting aquamarine waters. Difficulty: These badlands are a pussycat for walkers. Tenerife boasts an extensive network of trails and paths which link villages in remote areas. Many of these are a legacy of the indigenous Guanche people who used them to move their goat herds between mountain and coastal areas. The post conquest settlers also used these as merchant trails, creating ‘Camino Reals’ – Royal Highways which criss-crossed the island. These paths were still used until relatively recent times; some rural villages were only connected to the rest of Tenerife by road as late as the 1970s. The south of the island might now attract millions of visitors each year but before tourism, things were very different; there wasn’t even a road connecting the important centres of the north with the tiny communities in the south until the 1930s. Subsequently many of these old cobbled bridle paths are still in good condition and are wonderful ways to get to know Tenerife on foot. Consider Puerto de la Cruz in which to base yourself. La Orotava is just behind the resort in the valley of the same name and the Anagas are a forty minute drive away. If you want to spend your entire holiday hiking the Anagas, consider staying in the former capital city of La Laguna, or the fishing village of San Andrés just outside the capital of Santa Cruz. You’ll have doorstep access to the mountains and the beautiful Las Teresitas beach. Alternatively, choose Santa Cruz itself and combine a city break with your mountain air to give you a real holiday of contrasts; cosmopolitan shopping, museums, parks and a mountain range by day and great restaurants and bars by night. Walking in the Teno mountains and Masca. Consider basing yourself in any of the sunny south west resorts of Los Gigantes, Puerto Santiago, Playa de la Arena or Playa San Juan. The bus services from these resorts are less frequent than in the south and the north so a car becomes even more of a necessity if you want to explore the island from here. Resorts are less busy and generally the sunniest on Tenerife and you have the added bonus of beautiful sunsets over the neighbouring island of La Gomera. No matter where you stay on Tenerife it’s an hour’s drive up to the crater, unless you stay in the Parador in the crater itself. Choose to base yourself in any of the southern resorts of Los Cristianos, Playa de las Américas or Costa Adeje. If you prefer somewhere with more of a Canarian feel to it, consider the bohemian surf dude’s resort of El Médano where you can combine hiking with windsurfing and avail yourself of some of the best tapas bars in the south of Tenerife. You'll find more fascinating places and great things to do all over Tenerife in 'Island Drives'. If you're looking at this page, then you're clearly the sort of person who enjoys discovering the best of wherever you choose to visit. Make the most of your car hire and let Island Drives show you places most visitors never get to see. Water: Make sure you’re well stocked with water before setting off (1.5 to 2 litres per person). It’s worth checking if there are any places to refuel en route as walking under Tenerife’s hot sun can have you gulping the agua as though you’ve just emerged from the Sahara. If there aren’t any bars in the vicinity, look out for ‘zona recreativas’, they usually have drinking fountains with sweet, refreshing spring water. Clothes: Wear layers. Even in winter when walking at high altitude and initially the temperature may feel cold, it usually isn’t long before you find yourself sweating and have an overwhelming urge to do a Helen Mirren - strip off. Alternatively it might be August and the temperature might be red hot, but when the bruma (cloud) sneaks up through the pine trees and embraces you in a thick damp mist, chilling you to the bone, T shirt and shorts suddenly seem very inadequate. Sunscreen: Essential, especially when walking in areas with little shade such as Las Cañadas del Teide; the boiled beetroot look is not an attractive one. Hat: Ditto above. The waiting room at casualty is NOT on our list of preferred routes. Timings: Due to the diversity of terrain, routes of a similar distance can have significant differences in the time it takes to complete them. Our range of colourful, easy to use and informative 'Tenerife Island Walks' detailed routes are sent by email to you in PDF format within 24 hours of purchase. Over the coming months we'll be adding new routes covering the best walking on Tenerife and full of interesting facts, photographs and snippets to give you a complete guide to the countryside and access to places which most visitors will never see. If you don’t already have Adobe Acrobat installed on your PC, click here for your FREE download. Anaga Mountains ‘Stepping Back in Time’ - Cruz del Carmen to Chinamada (circular route) plus Afur circuit. Simply Stunning: One of our favourite walks on Tenerife includes dappled ancient forests, plunging barrancos, quaint hamlets, old merchant trails, a troglodyte community and incredible views of a landscape which looks much the same as it did when the original Guanche inhabitants of Tenerife walked these same paths and the post conquest settlers planted their first crops. Good thigh muscle workout but within the range of reasonably fit walkers. A lovely walk through a breathtaking landscape. Easily accessed from most of the main resorts and a hop, skip and a jump away from those in the Los Gigantes area, this route traverses the wonderful Valle de Santiago; a place whose natural beauty has defied the destructive forces of volcanic eruption and forest fires. The sweeping valley is home to small farming hamlets where crops are still picked by hand and has spectacular views of Mount Teide, La Gomera and La Palma. Invigorating. You'll know you've been on a decent hike. Our philosophy is that exploring the countryside should be fun and interesting as well as a good way of keeping fit. All the routes we’ve chosen meet this criteria. And the bonus points about Island Walks? Unlike bulky walking guidebooks, they fit easily into any pocket, so are easier to access during the walk and if they get ripped, soaked, or covered in mud…simply bin them and print off another copy. Some parts of Tenerife's coastline are simply breathtaking in their beauty and many coastal paths are accessible for most people. From hidden coves and lush palm groves to cobbled paths and grand old mansions; rock pools and cyan seas to dramatic cliff top paths, our ‘A Captivating Coastline’ guide includes our top five favourite coastal walks on Tenerife. Anyone who buys Real Tenerife Island Drives, Single Routes, or Island Walks online, will receive a FREE copy of "A Captivating Coastline" by email. The La Orotava Valley has charmed explorers and naturalists for centuries and any routes around the upper valley shows walkers exactly why. Our ‘Northern Exposure’ route heads into the forest and up into the higher reaches of the valley for some incredible views of the valley and Mount Teide from enchanting forest paths. An alternative route takes walkers through the pine forest and rural farmlands where country lanes are lined with wild flowers and the preferred mode of transport for local people is horse back. Good decent workout with some challenging sections near the start. A wonderful opportunity to take a trip back in time and discover the character of the south of Tenerife before tourism dominated its coastline. In the hills above Playa de las Américas and Costa Adeje is a landscape dotted with hamlets and agricultural terraces which feels far removed from the modern resorts which are occasionally stunningly visible from ancient summits and old merchants’ trails. Difficulty level 3: Walks are all under 3 hours in length and well within the range of reasonably fit walkers. Distance: 5 routes ranging from 3 to 8 kilometres in length. Highly recommended to any walkers staying in the south of Tenerife. Explore traditional trails of the southern highlands with 'The Old South'; the gentle beauty of the Santiago Valley with 'Into the Valley'; the rugged drama of the Anaga Mountains in 'Stepping Back in Time'; the captivating charm of the La Orotava Valley with 'Northern Exposure' walks; an out of this world experience with 'Hiking Highs' in the stunning Mount Teide Crater; discover 'Lost Worlds & Lava' in south west Tenerife & delve deep into the Masca Barranco with 'West World'. Buy all seven Real Tenerife Island Walking areas for only €9. With the 5 coastal walks in ’A Captivating Coastline’ added as part of our standard free offer, that’s a lot of Tenerife’s beautiful countryside waiting to be discovered. Walking in the Mount Teide crater is unlike walking anywhere else in the world. Spain’s highest mountain dominates, whilst weird and wonderful volcanic rock formations create an incredible landscape above the clouds that is a wonder to explore on foot. Follow in the footsteps of Greek mythological heroes (Clash of the Titans was filmed here) and leave the crowds in the tourist spots in the crater way behind. Difficulty level: Walks vary from a relatively leisurely, but breathtaking in more ways than one, 2 hour route to the ultimate Tenerife walk – climbing Teide. Distance: From 9 kilometres in length. Highly recommended to any walkers staying in the south or north of Tenerife. With quaint villages where age old traditions are part of daily life to hidden valleys and the scene of the most recent volcanic eruption on Tenerife, the south west holds some surprises. South West Tenerife is known for banana plantations, sunny weather and laid back resorts. These routes head inland from the coast to a countryside that has stunning views as well as being fascinating and full of unexpected curios of the sort that add that essential 'wow' factor to great walks. Difficulty Level: All the walks in this package should pose no problem to anyone with reasonable fitness levels. Distance: All the routes are 6 kilometres, but time to complete them takes between 2 to 4 hours due to difference in terrain. Highly recommended to walkers staying in the south and south west of Tenerife. From descending into the ancient and atmospheric Masca Barranco to experience one of Tenerife's most popular and breathtaking walks to going off the hiking beaten track to explore some divine countryside in a peach of a valley West World is another enchanting series of Tenerife walking routes. Whilst Masca is simply a must, our Teno Alto route is one of our favourites and as a bonus you get the chance to buy some goat's cheese that packs a flavour-filled punch. Difficulty Level: 2, 3 & 4: Although the walks aren't particularly lenghty in distance terms the terrain involves quite steep ascents. With Masca the terrain can be quite challenging in parts. Distance: All three routes range from around 5.5 to 8.5 kilometres ; Time: From 2 hours to 5.5 hours. Includes essential tips about walking in the Masca Barranco.